Legendary Drum Corps International Hall of Fame member George Bonfiglio, passed away Friday evening after declining health over the last several years. He was 79. One of DCI's founding fathers, Bonfiglio led the 27th Lancers Drum and Bugle Corps of Revere, Mass. for nearly two decades and was the very first chairman of the DCI Board of Directors. Starting the 27th Lancers in 1967 with wife Patsy, who passed away in 2008, Bonfiglio directed the group until the corps disbanded in 1986. He is a Korean War Veteran and taught elementary school in Malden, Mass. for more than 25 years. Bonfiglio was well known among the drum corps community for his forward thinking and resolve to keep his own group and Drum Corps International as a whole organizationally healthy and working toward a national spotlight. No corps may have had more airtime in the late '70s and early '80s than the 27th Lancers whose appearances outside of the World Championships on PBS included time on the popular Mike Douglas talk show and as part of the opening ceremonies of the 1980 Winter Olympics in Lake Placid, N.Y. "I think when you talk about George's contributions to the activity, the thing that jumps out at me is his ability to keep the corps, the Reveries and the 27th Lancers, alive for so many years, under some very adverse conditions, both with personnel and finances, when others may very well have thrown in the towel," said longtime 27th Lancers brass arranger James Wedge after Bonfiglio was inducted as part of the inaugural DCI Hall of Fame Class of 1985. "No matter how bad things got, George would keep prodding along and finding some way of making the corps successful." View funeral arrangements. 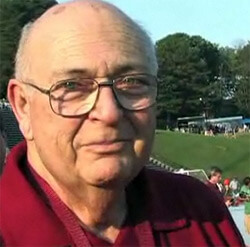 Remembering George Bonfiglio: DCI Hall of Fame Profile Fanfare: George B. as I know him Fanfare: More About Jerry Seawright and George Bonfiglio Bridgemen Alumni Corps pays tribute to 27th Lancers (video) 1997 Legacy Collection Vignette (video) Share your memories of George Bonfiglio by e-mailing feedback@dci.org.